Disclaimer: article contains descriptions of violence and adult themes which may cause offence. Well, it’s been awhile huh? I haven’t been doing too great personally; having restarted my third year at Uni and taking a leave of absence from my job to focus on my studies and my mental health which has dipped dramatically. But in all the bad times I have been going through, there has been one thing that has always tried to pull me back from the darkness… wrestling. I attended two shows on this day – the later of which I was supplied tickets to by the gracious people at WICID – so I will make sure to get to that review as soon as this one is up, but this one takes priority as it leads into the events of the other review. 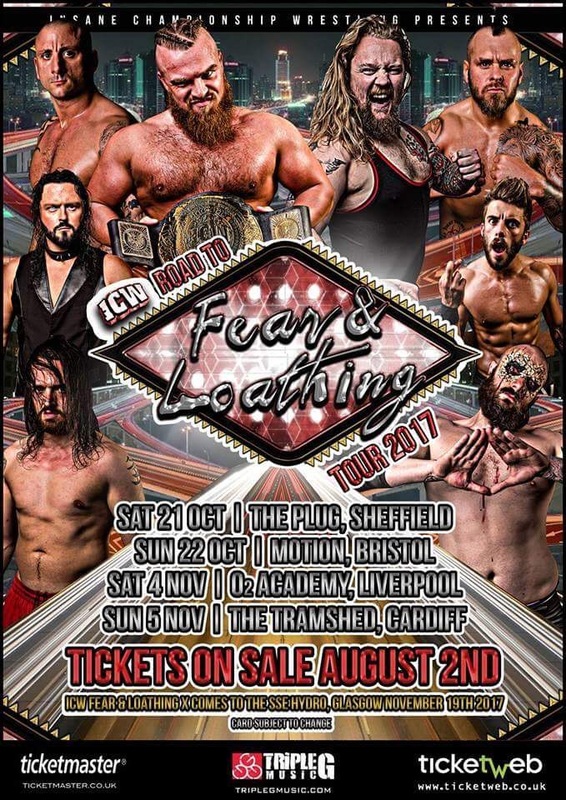 For now, know that I have covered this promotion in the past as the anti-PG Scottish-based promotion, Insane Championship Wrestling, a.k.a ICW. They once again made the trip over to the Tramshed in Cardiff. And as this show was 18+, expect there to possibly be unsuitable content contained in this article, though I will do my best to make it more readable to everyone if I can. ICW held a show at 1pm in the afternoon as WWE also had a show later in the day, and I wanted to get to that one, as that’s the one WICID got me two tickets to see. So somehow I managed to make it to the Tramshed in time for the first match as I overslept my alarm to catch the earlier train from home. And as those in the RCT should know, Arriva Trains on Sundays pretty much don’t exist. No transport exists on a Sunday, really. So I made it in time for the first match, which we will get to now! A nice, little opener which saw the arrogant Lionheart taking on Chris Redfrew. Chris mentioned at the start that he wanted the two of them to take it easy as he was slightly hungover from a Scottish Rules match from earlier in the week somewhere else while ICW were on tour. It was a fun little match with more high flying from Lionheart and just general grapples mostly. Redfrew won the match in the end as we got to the next match in a hurry. I could tell this would have to be rather quick with some of their matches so people could see the WWE show in time. Before the next match started, Red Lightning appeared to the displeasure of the Cardiff crowd, as he introduced us all to the ICW World Heavyweight Champion, Joe Coffey. He came out and trashed the Cardiff crowd for being so much quieter than they were last time, which in all fairness they actually were. I say its cause it was too early for most of them to be drunk. He went on to mock us, our local talent who were competing on the show tonight, and also those in ICW now. As he continued to taunt everyone around him, BT Gunn appeared in hopes of putting him in his place. Unfortunately, as Joe egged him on, Bram appeared and attacked him from behind. Joe then joined in on the attack, and despite a short time where Gunn did look to get some resistance, it was the villainous duo who put the fan favourite in his place. What a sour note to put people on huh? Ummmm, WOMEN’S ACTION THOUGH! YAAAAY?? 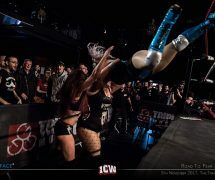 This Womens’ triple threat saw the return of Sierra Loxton to ICW in Cardiff. Would be nice to see her appear for ICW more regularly, but as she is more local to our country, it would be difficult for her to constantly travel back and forth between Wales and Scotland. Even still, she competed again Viper, also known as Piper Niven from the WWE Mae Young Classic. 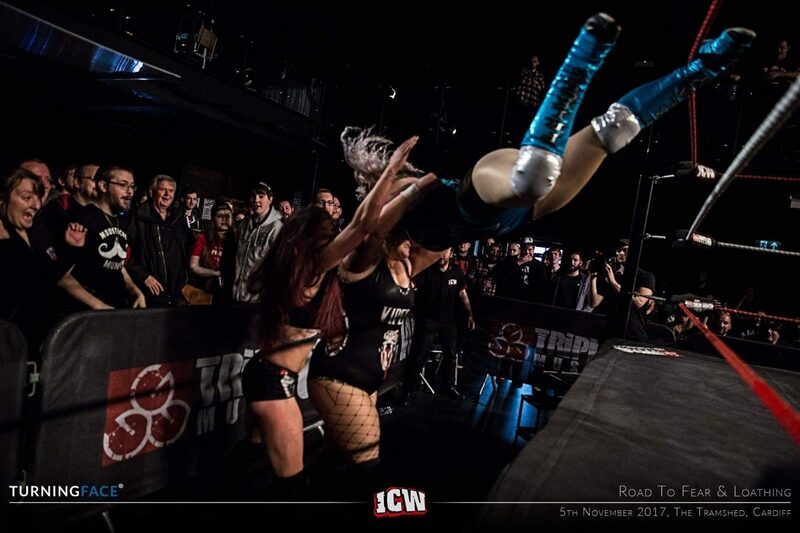 There was also the mouthy ICW Womens’ Champion, Kay Lee Ray, who blind-sided Viper before the bell rung and ‘encouraged’ Sierra to head to the back before she breaks another one of her bones, like she did at their last encounter in ICW – legit truth – that did happen. But as it looked like Sierra was heading to the back, she decided to stand her ground and went after the Womens’ champion. The action itself mostly had Kay Lee trying to get between Sierra and Viper, who both of them used their weight throughout the match, doing a few hip attacks – both into each other – and most of all into KLR. Viper even slammed Stevie Boy; who ran down at one point to help Kay Lee, and even the ref onto her as well. There was also feats of strength on KLR, where there were a few scoop slams onto KLR, with even the other women being slammed onto her. Kay Lee was able to interrupt the two from having fun by using shady shenanigans and the such to try to get the upper hand on her competition. Her ring smarts ended up working out for her, as when it seemed Viper had the match won when she hit Sierra with her Michinoku Driver finisher, but Kay Lee superkicked her out of the ring and got the pinfall victory over Loxton instead. As the champ made her snake like escape with her championship, Viper checked up on the Freak Princess as the two hugged it out and left for the back. This match was one of the first to really wake the crowd up. It had the home country tag-team champions, Bird and Boar; who as soon as the bell rang entered the crowd and yelled at TKP to fight them in the crowd, which they obliged, and thus, craziness ensued. They fought in the crowd for a good 80% of the match honestly. Shenanigans that followed included bodies being through into the Silver Seating section, which he obviously had to move out of the way for. Drinks being spat into other’s faces. People diving all over the place. Whether it’s Mike off a small table by the venue entrance, or from the top rope onto everyone in the crowd. Sha even got on top of the brick wall outside the building and apparently hit a Moonsault onto everyone!!! Crazy. I wish I could have been there, but I was only able to see the aftermath of that moment. By the end of it all, Bird & Boar hit their Gutbuster-Diving Splash finisher for the pinfall victory in the ring. After the match – as everyone cheered on for the home heroes – Mike sat down in the ring, crossing his legs as Boar stood over him while Bird had the Mic as it was story time with Mike Bird! He went on to say how they were supposed to be the tag-team champions, how ICW would rather have those who have better ‘company looks’ to be in their position. But it was the people at Cardiff from one of their shows a few years back who got the company to notice them more, as well as them working their backsides off for years and years. They WERE supposed to be two-time tag-team champions, but when they ‘won the titles’ at a previous Cardiff show, it wasn’t made official. They soon entered a tournament to crowd new tag-team champions when the belts were vacated, but they came up short. They kept coming up short, having obstacles put in front of them for so long… but look at them now. They then talked about how they would be going to the UK’s biggest, independent wrestling show at the Hydro in Glasgow, and how they were going to defeat Polo Promotions once again, to stay the tag-team champions. He said more things that made it sound much more passionate than I am making it out to be, but for those who have worked with both these men, trained with them, or are just fans of them, it was really something special to see live. After this we had a short intermission of maybe 10 minutes, just to keep up with the time for the rest of the matches. After this, we got an appearance from ICW Owner, Mark Dallas. He mentioned how they would have had their show at a later time, but they were aware that the World Wrestling Entertainment (WWE) had a show later on in the afternoon at the Motorpoint, which I will be covering later. Calm yourselves! Read through this first, you won’t regret it. He said he knows this, and moved this show to be earlier as ICW and WWE are friends. To prove it, he called out the WWE United Kingdom Champion, ‘The Bruiserweight’, Pete Dunne! The Bitter and Young Champion walked out to a huge ovation from the crowd when he got on the mic to say how he started out by wrestling in Bingo Halls down the road (SHOUT OUT TO ATTACK! PRO WRESTLING! ), and now he was a champion in the biggest wrestling company for the world. He would say that Mark had more friends in the WWE. He said he did, and he called out the C.E.O of WWE, ‘The Game’… TRIPLE H!! 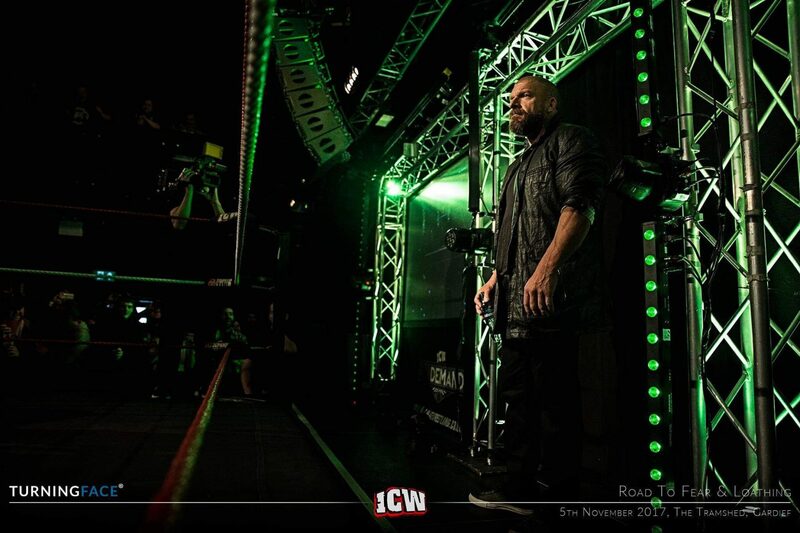 At first I thought, ‘Oh I wonder which ICW talent will come out to take the mick of him’, but a very brief moment was comfirmed when I thought, ‘Wait… I think he’s actually here!’ As The Cerebral Assassin himself walked out as everyone in the Tramshed, the British Wrestling Scene, and the internet, practically exploded. I legit couldn’t breath for a good ten seconds when I realised, ‘It’s him… IT’S TRIPLE H! TRIPLE H AT AN INDEPENDENT SHOW!! 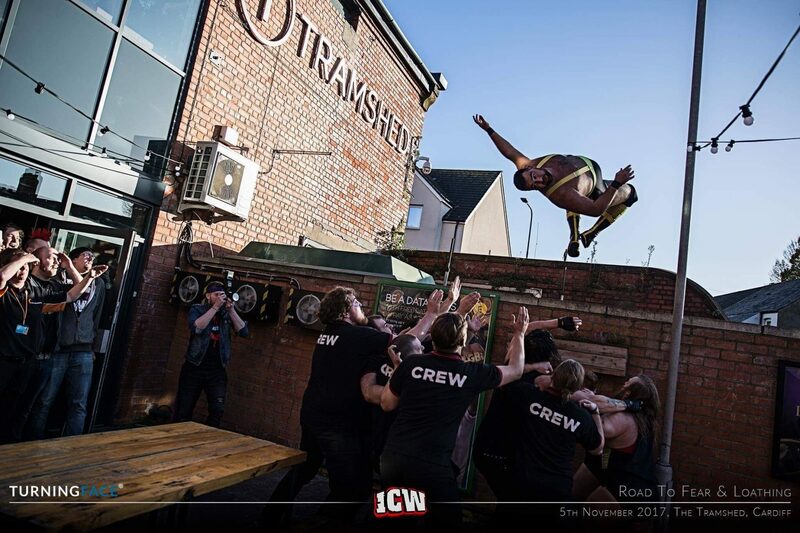 !’ Granted ICW is a much larger, Indie promotion and both WWE and ICW have a working relationship, but even still, THIS WAS ACTUALLY HAPPENING! The Game would go on to say how him and Pete popped down for a quick, few minutes mainly to thank the British Wrestling scene. He said that it really is independent promotions that create some of the current crop of big name starts, and that they are thankful for support local names of all kinds. He would go onto say that only bigger and better things would happen for WWE in the future, which seems hard to believe since they are the first promotion in the world. I mean what else could we see in the future, a UK themed show? … Hmmmmmmmm. Either way, the fact this happened at all make the last few weeks of bad times I have been going through just about worth it. After the whole ICW/WWE segment, we got introduced to Joe Hendry; who had a thin man slave with him. His name is apparently Leyton Buzzard from what I saw of him online. Joe came out and was very pro-PG which upset the fans as they shout profanities at him, where he refused to go along with them. He bragged about winning an British Senior Championship gold medal in freestyle wrestling, which in all fairness, is pretty impressive. But he did it in a way that basically devalued the accomplishment. He then told his servant to make his: “Safe Zone” to block out everyone, which he did in the corner of the ring. This brought out ‘The Original Badman’, Newport’s own, Beano, who got a much bigger reaction. Looks like Dunne and Triple H brought out the fire in the crowd finally. Hendry would carry on mocking Wales’ ‘Local Hero’… sorry, I had to. The match itself was as you’d expect, the young plucky Beano showing a surprisingly amount of offense on: “The Prestigious One’ through a hybrid of strikes and technical manoeuvres. The crowd chanted: “Local Zero” at Hendry as he was very sneaky and overly showman with his offence, which Leyton also tried to help him as much as he could. Beano did dive on both of them towards the end of the match, but it was another distraction by Leyton that led to Hendry hitting a Fallaway Slam on Beano for the pinfall victory. Before the next match began a few things happened. Red Lightning appeared once again and claimed that BT Gunn for ‘injured’ at the hands of Joe Coffey and Bram, so the Champion VS Champion match at the Hyrdo later this month would be in-question. Somehow I doubt this thought. He disappeared somewhere, I think he went to commentary for a bit? Or maybe he just left. Either way, NEXT MATCH! Ravie came out to much love from the crowd and was very jolly. Whereas Wolfgang came out in a serious demeanour. Wolfgang came out in casual wear as he said he didn’t want to even lace his boots against Ravie. Instead, he got someone else to take care of him. Enter Stevie James and Krobar, better known as ‘The Purge’. And this now became a handicap match. Ravie did try his best as the crowd supported him, but The Purge outnumbered him with brutal beatdowns. In the end, The Purge hit a Superkick/Sidewalk Slam combo to get the pinfall victory. After the match, the two held up Davie in what looked like a post-match beatdown for Wolfgang, as he came back in with brass knuckles. However, instead of beating him down further, he said that he earned a little bit of respect for still standing up after The Purge beat him to a pulp. If he can beat Bram at the Hyrdo, then he earns his compete respect. The trio then left as Ravie seemed baffled by this weird act of kindness. Representing ‘The Filthy Generation’, Stevie Boy came out along with a re-appearing ICW Womens’ Champion, Kay Lee Ray. He was set to face The Welsh Valley’s own, Big Grizzly, who got a nice reaction. The match itself mainly had Grizz being incredibly hard-hitting with his powerhouse moves, while Stevie would be very tactical with his dirty shenanigans, as well as KLR doing whatever she could to distract Grizz when things weren’t going well in her team member’s favour. Things were getting a bit hectic as the match went on with both men low blowing each other. There was also a moment where Kay Lee accidentally hit a Canadian Destroyer on Stevie. She ended up getting Chokeslammed by Big Grizz despite his earlier attempt to tell her to stay out of his way. The man ended in a less than liked manner when Steview spat something into Grizz’s face and rolled him up for the pinfall victory. As the villainous duo smugly left, Big Grizz was close to leaving himself when someone by the name of Thatcher Wright appeared. Donned with a very conservative gimmick and a book with Margaret Thatcher’s face on it, the crowd immediately showered him with profanities against the ‘Tories’. Big Grizz decided to go back into the ring, hit Thatcher with his book and Chokeslam him to leave everyone on a much happier note. This main event… oh jeez, words cannot describe everything that happened. Not in a family-friendly way at least, but then again not much about this article has been family-friendly. So I’ll do my best to cover all of what happened. Within the first minute, Jimmy pulled out a stapler from his trouser and immediately used it to stable Mikey’s head, and both sides of his crotch. Mikey got thrown into the crowd barricade early on, and the force which Whiplash hit it actually caused a few fans to fall over, pouring their drinks over themselves. Luckily no one was hurt, and the people in question were laughing it off. Havoc bless his heart immediately helped up one or two people asking if they were alright, looking visibly worried. Despite being kind of a ‘psychopath’ he really does have a soft side. More shenanigans that took place include bodies being slammed into thumbtacks. Barbwire cover chairs being used into backs and bodies being thrown into. Light Tubes being smashed into heads and backs. CONCRETE BLOCKS being slammed into. It was just truly insane. It really could have gone either way. But it was after Whiplash got slammed into the concreate blocks and then picked up for an Acid Rainmaker by Havoc to get the pinfall victory. The way this show ended truly summed up how truly, well, insane this match was. I guess we can see why they call it INSANE Championship Wrestling now. The show did start off slow, but it slowly picked up as the matches themselves got more intense, and it is safe to say the special appearances of Pete Dunne and TRIPLE, BLEEPING, H, definitely helped out. But as one of the last few shows before ICW’s biggest event of the year, it was a great way to hype everyone up for that show. 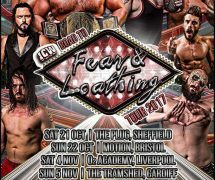 The show in question, if anyone is interested is Fear and Loathing X which is being held at the SSE Hydro in Glasgow, Scotland. 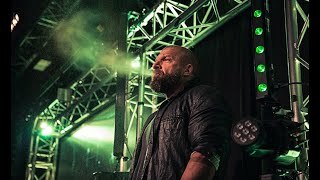 The show will include many of ICW’s biggest names, as well as some special appearances from the likes of Kevin Nash, Rob Van Dam, who will compete against Zack Gibson and Lionheart. Plus Rey Mysterio, who faces Kenny Williams. So that’s it for the first half of this truly amazing day. Make sure to stay tuned for the second Wrestling review which will be up soon after this one. Until then, make sure to look up ICW’s social media if you wish to do all the social stuff.